So, you are planning your wedding, either on your own or you have hired a professional wedding planner. There are so many tasks to do, so many vendors to hire, caterer, decorator, florist, photographer, venue, music, wedding car and so many things! Hope you haven’t forgotten a very important thing – your honeymoon! After all, all your wedding preparations are going to and should end up in an unforgettably beautiful wedding night and a honeymoon thereafter which you will treasure forever! So, have you planned for such an awesome wedding night? Here are some tips. Your first night is the most romantic night of your life. Where do you want to spend it? Do you want to book a hotel room or celebrate it in your own house? This depends on individual choice. Some couples find it comfortable to be away from the hustle-bustle of guests at home on the post-wedding night; so, they would want a hotel room for the first night. Some others would prefer to stay at home as they have no problem with the crowd. Decide the location of your first night with your partner. It’s quite common that you don’t get time to eat during the ceremony and reception. According to the tradition in a Hindu wedding, the couple has to do some fasting. In that case, you better arrange to have some food in the room. Think upon what you would like to have after all the fast-paced events across the day. Maybe you would like to have something light and tasty, like a juice, soup, salad, fruits and a dessert. Make it a point to have something which will evoke a happy and romantic mood in you and your partner. It depends a lot on the decoration of your first-night bedroom that your mood becomes romantic and you feel top of the world. Therefore you should instruct your decorator about exactly what you want. The decoration should be such that you should feel relaxed and restful, as well as romantic, after the hustle-bustle of the day. You should also feel comfortable to talk openly to your partner to build a strong bond between you two, instead of keeping a dislike about the atmosphere in the room and so, feeling uncomfortable while getting close to your partner. The color scheme of your bedroom plays an important role in creating the mood for the evening. Choose soft pastel color shades like cream, pink or blue. Of course, you may like to have something bright to indicate your bright future, like red or orange with a touch of golden. Once you decide the color scheme, you can choose bed sheet, curtains, flowers, tablecloths, candles etc accordingly. The bed is obviously the most important part of furniture in the room that should evoke a romantic feeling in you and make you eager to enjoy the night. Think upon it beforehand (during your wedding planning) and decide whether you want to keep it simple or add something creative. You can have a bed with posts on its four corners and curtains hanging down from them. You can choose to have beautiful curtains, like netted curtains or embroidered silk curtains to create an extremely intimate feeling of privacy where a little world has been created with only two people – you and your partner! You can even create an atmosphere of heaven by adding cloud-like bed sheet and curtains. There are countless ideas – just play with them! If you are worried about having to change the linen the next morning and being embarrassed before the guests, use a mattress protector! 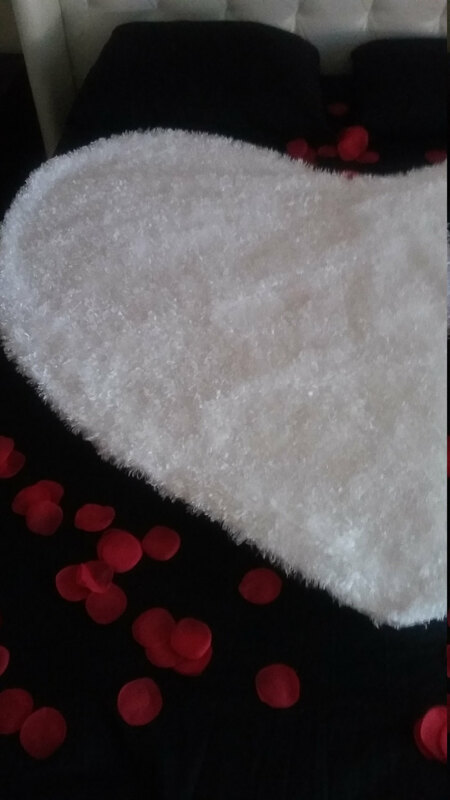 Intimate Hearts is such a mattress protector which is as good as a bed decoration. It’s available in so many colors and is so soft, beautiful and sensual that it will at once invite you to intimacy. You can see some of them in this article and many more on their site. And the pictures will guarantee you that they won’t come in the way of your decoration, but instead will add to it with their great colors, textures, richness and romance. It’s common to decorate the newlywed’s bed with flowers. However, one or both of you two might be allergic to flowers or their fragrance. If that’s the case, instruct your decorator not to include flowers in the decoration. There are many other beautiful items with which the bed can be decorated such as pearls and other jewels, colorful feathers, silk motifs and so on. However, before using any of these objects, make sure that none of you is allergic to them. As important as your color scheme is your lighting. Never have bright or fluorescent lights in the room. Instead consider a number of small lights spreading soft light that will create a dim glow. Such type of lighting will increase the sensuality of the atmosphere in the room. It also adds a superb glow to everything in the room, including your clothes and makes them delightful. Overall the lighting has a long-lasting impact on everything and so, you should choose it carefully. You can create the same glow even with candles. Prefer aromatic candles with an aroma preferred by both of you to add an extra element to the atmosphere. You can also add some extras, after deciding the bed decoration, mattress protector, food, color scheme and lighting. Here sky is the limit for your creativity. There are so many things you can choose. For example, you can have a full size mirror beside the bed to give your romance a wild touch. You can also have many other additions like chocolates, champagne, strawberries and more to please yourself and your sweetheart. Go for fashionable toiletries such as handmade gourmet soaps and perfumes. And of course, you can give your partner that special honeymoon gift that will create a great feeling of romance in both of you! Using these tips, if you make a plan for your first night too along with your wedding planning, you will enjoy your wedding in a true sense.